"Mistletoe At Work", poetry about workplace dating and sexual harrassment. There exists a new enlightenment. Due to high visibility harassments. The shocked underlings yell out: "Stop!" So we'll see far fewer such enactments. You'll be gone in a wink. When you see mistletoe at work. After the transgressions of a powerful few. Til I've walked a mile in the harasser's shoes. He might as well head for the exit door. Because HR's patience has shrank as of late. Has vanished. Now lengthy bread lines await. Between the peons and the big wigs. Concerning topics like male twigs and figs. VERSE 5 - "An Ode to Coworker Stalking"
Here's a new way to handle things. But telling her so would get you canned, for sure. Follow her around, but stay back pretty far. Pull over into the stall beside her. Go on and complement her cool tennis skirt. Then say you prefer Wimbledon to the Super Bowl. 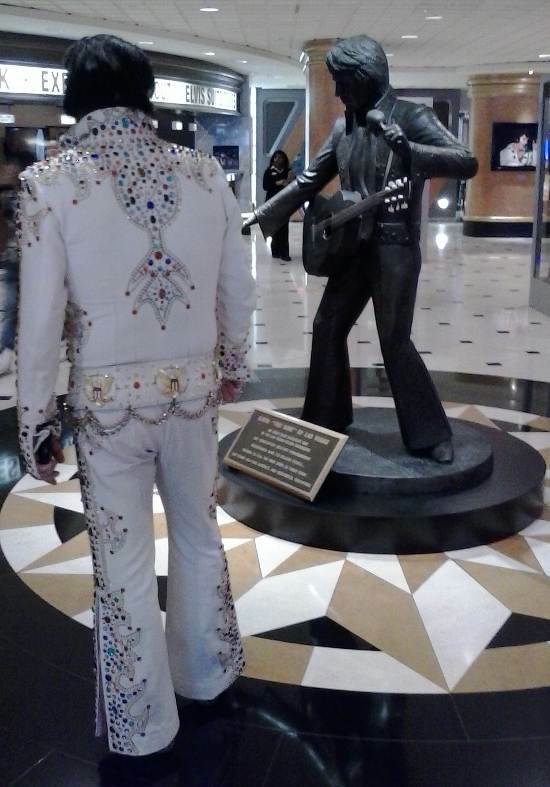 Where they impersonate the King of Rock 'n Roll. When you get back to work, best avoid the mistletoe. Keywords: Poems about sexual harassment, Dating coworkers, Workplace dating poetry.